I am happy with the end result. It has the feel that I was trying to capture. After giving birth there is this strong, amazing emotion. Fierce, but not violent. Try looking up at the sun and closing your eyes. What you “see” behind your closed eyes, the smoldering intensity, it feels kind of like that. At least it did for me. And by a strange coincidence this week’s Illustration Friday topic is “Baby”, so I thought this was appropriate. This is a beautiful illustration. Your emotions are very evident in the handling of the forms in your piece. The very best artworks are those that are heartfelt. beautiful painting! i can feel the emotions. 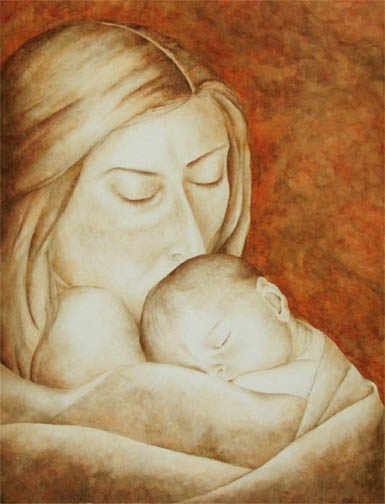 Very beautiful image–the technique reflects the softness of the moment and the baby. Beautiful painting, the colors you used really captured the smoldering intensity you talked about. It’s full of emotion and tenderness, as well.